With the imminent arrival of the newest addition to our portfolio, we thought we would put together a little bit more information on Chateau Moulin Haut-Laroque. We are really excited about this fantastic mature Bordeaux from the Fronsac area and believe the 2002 to be an absolute bargain. To pre-order, please contact the office – 01875 595 100 or email – orders@de-burgh.com. 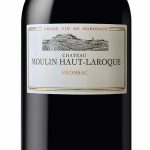 We are shipping this direct from Bordeaux and expect it to be popular, so don’t miss out. The Chateau has longevity in producing wine. The oldest bottles in the family cellars are from 1890! The Herve family have been in charge of the estate since 1977 and Jean-Noël & Dominique Hervé are the ones who made Ch. Moulin Haut-Laroque famous around the world. Jean-Noël Hervé is even defined as the last samurai into the japanese manga “The drops of God” . In 2012 Thomas Herve took over the day to day handling of Moulin Haut-Laroque. He is determined to run the Chateau as a dynamic family business and keep things boutique. He is passionate about the wine trade and producing fantastic wines for those who appreciate great Bordeaux. The vineyards are spread over 16 hectares in Fronsac with 65% Merlot, 20% Cabernet France, 10% Cabernet Sauvignon and 5% Malbec- which happens to be at least 100 years old! The vines are on average 40 years old which gives real concentration of fruit. The winery has really benefited from investment to create a modern space for excellent winemaking. Once the grapes are all picked manually, each bunch is removed by a picker and then sent by a carrier to a mobile table for an initial examination so as to keep only the best grapes. Depending on the year, this operation can involve between 25 and 50 people. On reaching the vat-room, the grapes are tipped on to a sorting table for elimination of all those considered to be imperfect. The stems are then removed to leave only the grapes proper which then move down a long, vibrating table where 6 to 8 people continue the sorting to keep only the very best. To avoid damage from pumping into long pipes, the grapes are fed into the vats directly by gravity. The wine is aged for 15 or 18 months in barrel, with 35% new wood. Limestone soils- which are prevalent on the right bank of the river in Bordeaux, can give an idiosyncratic character to Merlot dominated wines. It gives structure, firm definition and enhances the fruit which is concentrated and expressive. Earthy, with a hint of sweet spice, this wine is hearty in all the right ways. The tannin is well integrated and the black fruits are still fresh. It would be perfect with a charcuterie board, cheeseboard, stews or a steak…. Moulin Haut Laroque is here!! Due to popular demand, there is now limited stock. If you wish some before it has all gone, please go to our website or e-mail the office.